Copy length. It’s been somewhat of an obsession of mine lately. For marketing copywriting. Heck, for content in general. So I was really looking forward to running a pretty simple copy length test – long vs. short copy. However, the interpretation was anything but simple. In fact, at first I thought there wasn’t a significant difference between the control and treatment…until we dove down a little deeper. 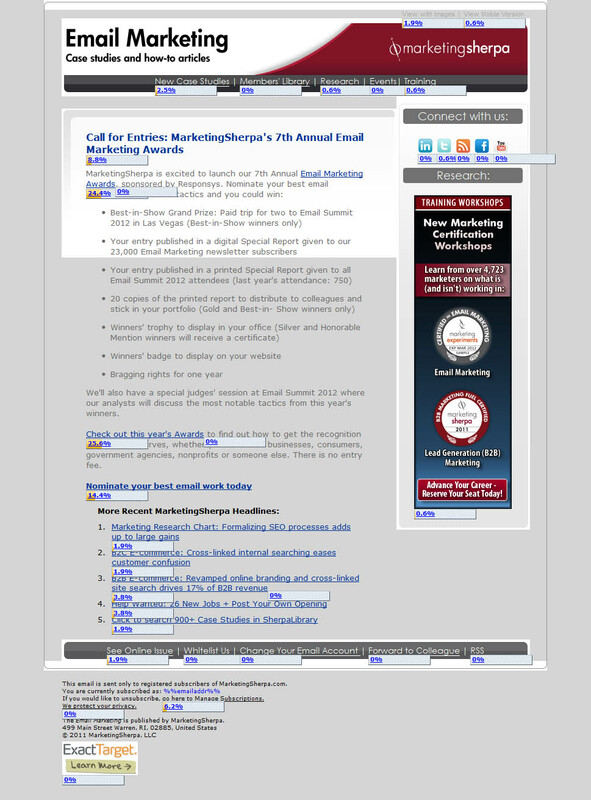 The email send was announcing the call for entries for MarketingSherpa’s 7th Annual Email Marketing Awards, sponsored by Responsys. As you can see, the copy is quite long, as we try to cram in many details about the awards from the Grand Prize trip for two to Email Summit 2012 in Las Vegas to the fact that there is no entry fee, before ending with the final call-to-action link – nominate your best email work today. For the treatment, Senior Reporter Adam Sutton hit the high points, added in an “And so much more …” and gave them the CTA link. Bim, bam, boom. …and then we waited with bated breath for the results. As a writer, I felt that surely copy length matters. Words do matter, don’t they? People still read what we write, correct? And then the let down of all let downs, I got to feel like a soccer fan for a day – a tie. A totally unfulfilling ending. There was no significant difference. But here is why test interpretation is so important. What I did very next was extremely fateful…. I complained to Adam Lapp. Our optimization and strategy research manager looked at the click maps and noticed something that I hadn’t – the “More Recent MarketingSherpa Headlines” links at the bottom of the newsletters seemed to be getting more clicks in the shorter email. We were going into extra innings! This was no longer soccer, we now had ourselves a ballgame. We were going to have a winner, even if we had to get the second basemen to pitch to do it. I reached out to our marketing technology expert, Zlatko Papic, and sure enough there was a difference in the emails. When looking at total clicks, for the longer email, only about half of the links were clicked at least once. For the shorter email, every single link was clicked at least once (actually, the minimum was six clicks). While most email marketing optimizers focus on unique clickthroughs instead of total clickthroughs for good reason (one rabid fan might just be particularly “click-happy”), total clicks may be a valuable metric as well in some instances. In our case, what we learned was that shorter copy for the main call-to-action gives our secondary calls-to-action a chance to shine. In the short-copy treatment, there was less repeat clicks on a single link, and more overall diversity of clicks. I would hypothesize that many readers might have clicked a secondary link first, since the secondary links had greater attention from a shorter main call-to-action, and then came back to the email to learn about the main CTA (entry into the Email Awards). In our case, while we certainly had a primary objective CTA, I’m just as happy if a reader clicks on a recent article as that primary objective CTA. This was, after all, the MarketingSherpa Email Newsletter, not a marketing send. While we might have had a primary objective CTA, when we step back and look at the big picture, our real primary objective is just to engage with the audience. And I think that’s the biggest takeaway form this test for me. When any of many objectives will do, make it easy for those secondary objectives to be found. Shorter copy for the main objective is one way to do that. When one key objective is really important to you, give it greater emphasis. Either with more copy (and perhaps images) and thus more real estate in a newsletter, or by stripping out as many competing objectives as possible in your email template. Multiplying each email’s total clicks by the given percentages, it appears that the shorter copy also earned more clicks on the four Awards links. The shorter copy is definitely the winner here. THIS isn’t really a long copy vs short copy test. Long copy is upwards of four pages usually, often 16 pages. And the primary objective surely should be registrations for the awards. After all, this isn’t awareness advertising. The purpose of a real test should be clear cut: bookings or sales. Not just click throughs. You make an excellent point. “Long copy” and “short copy” are relative terms. To be more specific, these emails had copy that was long or short as compared to our average sends. What is considered long or short will vary heavily from company to company, although I must say, I’ve never seen a 16-page long email. You also make an excellent point about having a clear KPI. While we did get more clicks on the Awards link, which was our primary objective, since this is a content newsletter, getting clicks on secondary objectives was pretty OK as well. But a takeaway from this test is, as I mentioned at the end, when your main KPI vitally important, such as a direct sale, and you care not about brand engagement, give that main CTA as much emphasis and real estate as possible. Strip away as many distractions as possible. They may even include that most popular of new additions to so many emails — the social media sharing buttons. A word about “total clicks”: I realized after thinking for awhile that a particular client had a particularly “click happy” subscriber that the same email was being forward around a company using the email client’s “forward” button and not the “Forward to a Friend” feature in the email. The former process is used much more than the latter. When I realized this, I stopped completely disregarding multiple clicks. Daniel – happy to send you over an example currently working 16 page email promotion. I have examples of B2C emails for either one-off books or subscriptions to a newsletter. There is a debate about whether long B2B emails work. Mine are mostly consumer. Some are to specialist health professionals, so they count as businesses I suppose. My direct marketing colleagues all say there is no difference – long copy works in all markets and the same rules apply across the board. I agree with that. But there are very few long business email examples around. Even fewer than B2C long emails. It’s a specialist copywriting area with few exponents willing to share. Ooooh, how enticing. Please send it to — editor AT MarketingExperiments DOT com. I’m a fan of direct response advertising. So, I’ve been told over and over that long copy outsells short copy but good to know about your test results. I doubt that anyone would question that the majority of people are not like us and for them short copy will usually generate more response. As Peter mentioned, what really matters is achieving your goal and for that you need to know your audience. What I and my collaborators will do is totally different than what the general public will do. We are writers and love words and love to read and most of the general public do not share that passion with us. I think this underlies any important point, I think we tend to underestimate the knowledge of our audience. How much do we need to explain? How much do we let people explore? Psychologically I think people need to feel empowered to make a decision about what messages they are willing to hear and act on. Giving them a chance to check something out and then respond is a good call for them. I’ve been experimenting with email communications and outreach campaigns.Long emails get few responses, even when I think it contains need to know info. If I type a one paragraph email that clearly tells someone why I sent it and what I need them to do I get more engagement. I have my website and network info in my signature. In short emails some or all usually get clicked. Even if my request is unrelated. Long emails seem to get ignored as spam. That is what I’ve noticed and to me your results make sense. If we got paid on website HIT’s then this would be significant. But in the words of Gary Halbert, HIT’s stands for – How Idiots Track Success. The real measure of success comes from the number of conversions after the click-through. And ultimately, profit. Short copy, in this case, may have increased the number of “clicks”. And short copy may or may not be effective at increasing buying behaviour. But as far as proof that short copy is “better” than long copy… this test doesn’t really prove anything. Would you rather have 366 clicks at 1% conversion, or 183 clicks at 10% conversion? We certainly weren’t trying to definitively prove, without any shadow of a doubt, that one test proves an age old debate is finally settled — that either short copy or long copy is better. If the blog post sounded that way, it’s only my weakness as a writer. For many tests I agree with you, the real measure of a success is often not a hit. I’d go one step further and say, many times, it’s not even conversion. It’s revenue. Even for a non-profit. However, where we disagree is that revenue or conversions is absolutely always the best KPI. It’s simply not. I think the content we’re discussing in this blog post is one example of when conversion is not the best KPI. Here’s another one. At MarketingSherpa B2B Summit 2011 in Boston I interviewed IBM’s Marjorie Madfis about her testing on the IBM Software Group homepage (and I’ll be interviewing her colleague, Joan Renner, at B2B Summit 2011 in San Francisco at the end of October). So, Jake, I think you make an excellent point. And it is fair to say I may have glossed over conversions a bit in this blog post. But sometimes, in certain occasions, us idiots don’t have a better way to track success than, simply, hits. Did you try to segment the results in a follow up experiment? To add people who clicked on the links the most into one group. And people who didn’t click as much into another group. Some people respond better to copy or some people like clicking on links? The one’s clicked on the links, we’re they more likely to be new to the email newsletters or been reading the emails for longer time? I think she had an interesting methodology that I hope to share in the near future. I think it may be helpful for marketers focused on content marketing. But, Charles, your ideas are excellent and may be helpful to some readers of this blog. Given the nature of the Internet and the fact we’re all told that paragraph length must be kept short, shorter and shortest, I’m not surprised at the results. Internet direct response is totally different than direct mail. Just the knowledge that so many other bits of information are out there on the Internet clamoring for my attention creates a sense that I have a limited amount of time available for each item. If the time I spend to read an item goes past a certain point, a sense that I’m missing something else extremely important hits me. This is a completely different situation than the direct mail I get in my mailbox. I know how much is there, I have an idea of what each piece is about from looking at the envelopes and I know roughly how much time it will take to sort through it. This test just adds more fuel to the fire. If you write long copy that is indeed blah blah blah blah like you said, short copy will work better. If your topic are low relevancy and people aren’t really interested in what you are writing about – short copy works best here, too. At least on the web. And especially in email. With email – it’s “How fast can I delete this and get it off my computer screen!” That’s what email is all about. Speed of delete. Most are read with the reader’s hand over the delete button. Or the “click here” button – because that gets them to another screen, also. But if if you’re selling paint, or lawnmowers, or services that are relevant – by email or by traditional mail – and your descriptions are benefit laden, and features rich, without too much bs that doesn’t matter to the reader – you can be more responsive in long copy. If you’re selling by web or email – which like TV turns out to the home of the attention deficit disorder – you know, short attention span theater – the copy needs to be shortened for the media where it’s placed. My response to long copy (as a reader) is generally “get to the point”. Most of us receive too much email and have too little time. Just tell me. Just share it. Cut the waffle. My view is long sales letters work in terms getting clicks on the CTA because it’s either that or cut your wrists. The CTA is the less painful way out. Dobkin probably had a great time composing the above but I read the first line. As soon as he gets cute about the secretary (presumably to pull me in to the story), I bolted. I skimmed the rest, picking up a line here and there. The secretary stuff is superfluous. It wastes my time. It annoys me. Dobkin could have written only the 3-rd from last and penultimate paragraphs, still making his point. In the context of the original test, if my time isn’t wasted by superfluous copy, maybe then I have more time to click on links and read other useful stuff. Always good to see what works and doesn’t, though you can’t always extrapolate greatly. Under these conditions (list, product, audience, etc.) one treatment outperformed another on a secondary KPI. That may have more general relevance but is less and less likely the more you move away from the particulars here. I know both long and short can work well. In the 2 versions above, it mostly looks like the “short” one condensed some unnecessary bullets that weren’t really very compelling to start with (“You mean I really get a badge!”). The more specific takeaway could be what sorts of prizes/benefits are compelling to people and worth taking the time/space to enumerate and which aren’t. Thanks again for the interesting work. I think this may have been said before. It comes down to the headline, the offer you have, and the urgency for call to action. Then, if your deal is worth it, they will buy it; so long as your reputation is ok. If your name is plastered all over the complaints sites; well then your conversion rate may sink. At Weezoo.com, we provide leads to service providers; making appointments for them as well. The appointment setting has been the killer app for us. However, it does take time for the customer to trust us; especially, if they are about to spend $25K to remodel their kitchen.